Foiling is the hottest thing in sailing right now, and our friends at Sail Black Rock in Bridgeport, CT and Oakcliff Sailing in Oyster Bay, NY have teamed up with WindCheck to present a unique writing contest with perhaps the most exciting prize in the history of youth sailing! The winning essay will appear in an upcoming issue of WindCheck (No, that’s not the prize), and the author will receive a scholarship for a one-week Oakcliff Foiling Camp July 1-7 (a $2,030 value)! 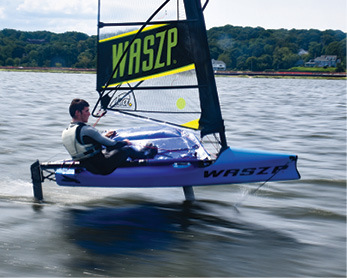 Utilizing the fastest boats in Oakcliff’s High Performance fleet (WASZPs, foiling Nacra 17s and foiling carbon Nacra 20s), Foiling Camp will get you up and flying. And because fitness is essential for foiling, Oakcliff’s expert coaches will provide personalized advice on how to take your training to the next level and earn your wings at Oakcliff Airlines. This contest is open to applicants ages 14 to 19 (inclusive) that have some sailing experience and a desire to go foiling. Essays must be original works of written art. The maximum length is 700 words (excluding title & biography). Please don’t include applicant information on the essay page(s). Please use 12-point Times New Roman font, double-spaced. Please don’t include graphics, borders, colored fonts, or photos. Please list your name, grade, address, phone number, and email address. Include your sailing awards & achievements, school & community activities, and plans for college. Include your high school’s name, address, and phone number. Please limit your biography to one page. All submissions must be received by Wednesday, May 1, 2019. One (1) scholarship for Oakcliff Foiling Camp, to be held July 1-7, 2019 in Oyster, Bay, NY, will be awarded to the author of the winning essay. The winning essay will be published in WindCheck. All contestants agree that their essays may be published in WindCheck and on the WindCheck, Oakcliff Sailing, and Sail Black Rock websites. Contestants must agree that if their essay is chosen as the winner, it will become the property of WindCheck, Oakcliff Sailing and Sail Black Rock. Contestants further agree that the winning essay may not be submitted to any other contest or used for any other purpose. Founded in 2011 and located at Captain’s Cove Seaport in Bridgeport, CT, Sail Black Rock is the home of the Fairfield University and Sacred Heart University sailing teams. Under the leadership of Program Director Dave White, Sail Black Rock hosted more than 500 visiting collegiate and scholastic sailors last year. Regattas include high school national qualifiers, intersectionals such as the Catholic Cup, intercollegiate performance ranking races including the SHU Trophy and Fairfield Cup, and the New England Freshman Championship for the Priddy Trophy. In addition to variant sea conditions of Long Island Sound, participants enjoy post-race pizza parties sponsored by Regatta Ginger Beer. Located in Oyster Bay, NY and led by Dawn Riley, the first American woman to do four America’s Cup campaigns and two Whitbread Round the World Races, Oakcliff Sailing is an unparalleled training facility with an innovative environment that infuses sailors with a culture and drive for success. Over the last eight years, Oakcliff has placed graduates in such programs as Vestas 11th Hour Racing in the Volvo Ocean Race, Red Bull Foiling Generation, and New York Yacht Club’s America’s Cup team, American Magic. If you’re ready to Elevate Your Game, visit oakcliffsailing.org. Launched in 2002, WindCheck is your source for Sailing the Northeast. Headquartered in Darien, CT, WindCheck publishes 10 issues per year…and has almost certainly had more foiling boats on the cover than any other publication. Visit WindCheck online at windcheckmagazine.com.